Many CGS members and users of our library may know that the society has a Manuscript Collection, but may not be aware of the rich personal material that can often be found therein. A prime example is alluded to in the title of this article. One of our larger collections was compiled by John Ellis Hale, a past President of the society. The collection, listed as “Hale” in the Manuscript Database Index available on our website, is described as Mr. Hale’s forty years of research on the Hale and Bemis families and related lines. Under the surname description of the collection are forty-eight surnames for which some material exists. In 1891 Martina Kurrer, a native of Switzerland, planned to immigrate with a friend and settle in California. Shortly before the trip, Martina’s friend was unable to go, but Martina, who had already purchased her ticket, decided to travel alone. She arrived in New York, then boarded a train for Tulare, California. She settled herself on the train as comfortably as possible with a big pillow and blanket that she had brought with her. Speaking no English, she had difficulty purchasing food, but shortly after leaving Kansas City, she heard German spoken near her and began conversing with the speaker, a man of about 45 years of age. He offered to assist her and helped her obtain meals. 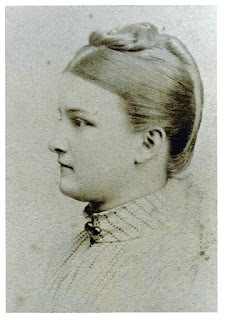 As Martina kept a diary on her trip, she remembered that on February 26, 1891, after having dinner that the “strange, quiet man” brought her, she settled back to sleep with her head on her pillow and had a dream in which she was home again in Switzerland with her sister at a house party. Her sister commented that Martina’s hair was very messy and urged her to go dress it. Martina woke with a start. The dream seemed so real that she got up from her seat on the train and stepped into the dressing room to comb her hair. While there, she heard several shots, then people screaming. A gentleman in the car said to Martina, “My girl, you have had a wonderful escape from a terrible death,” and pointed to the place where she had sat only a few minutes ago. Just after she got up, a young man across the aisle had left his seat and moved to hers, resting his head on Martina’s pillow. 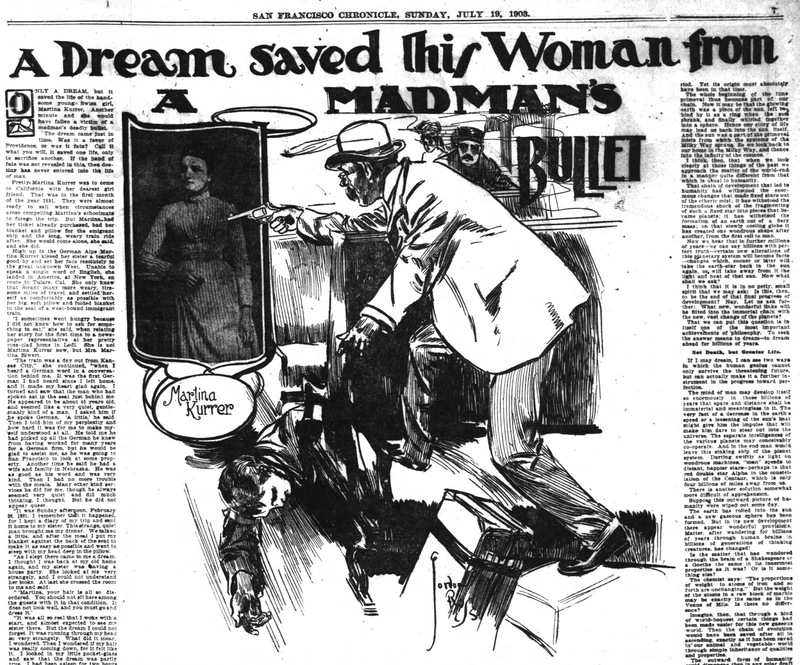 The man who had befriended Martina went berserk and placed a revolver against the young man’s head and killed him. He then began shooting up and down the car, wounding two other passengers as well. The killer escaped the train on foot, but realizing that he was being pursued, cut his throat with a razor he had in his pocket. Martina kept the pillow and blanket as she had no others and the next day reached her destination in Tulare where she was met by friends. Martina married Max Elwert on August 15, 1893 in Los Angeles. They had three children: Theodore, Anita and Lawrence. Sadly, Martina died in childbirth at the age of 38 on December 29, 1905, in Lodi. Newly available in our Manuscript Collection Database are finding aids for three collections: Covell, Hale, and Sherman. We will continue to transcribe and upload additional finding aids and advise as they become available. Georgia Lupinsky is co-chair of the CGS Manuscripts Collection. *"A Dream Saved this Woman from a Madman's Bullet," San Francisco Chronicle, 19 July 1903, p. 7; digital image, Newspapers.com (https://www.newspapers.com : accessed 11 February 2019).